St. Louis Blues: What is Robby Fabbri's Future? What is Robby Fabbri’s Future? From the moment he was drafted in the first round in 2014, Robby Fabbri was one of the most highly thought of young players in the St. Louis Blues system. When he made the team out of camp in the 2015-16 season, he continued to soar in the eyes of both the fans and the front office. But Fabbri’s meteoric rise was brought to a screeching halt by a pair of consecutive and very serious knee injuries. Entering the 2018-19 season, it was clear that his return would be an uphill battle, but fans remained hopeful that he could regain his former glory. Unfortunately, that has not yet happened, and a season of relative insignificance is forcing fans to question what is next for the young forward. The Blues selected Fabbri with the 21st pick in the 2014 Draft, but he had made a name for himself before that. 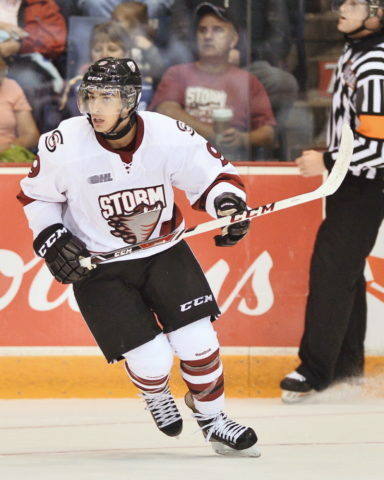 In his draft season, with the Guelph Storm he collected 87 points in just 58 games, but it was the playoffs where he really shined. In the postseason, he collected 28 points in 16 games en route to an OHL Championship and playoff MVP honors. Those numbers were enough to make the Blues brass proclaim Fabbri as their selection from the stage in Philadelphia. They believed that, despite his relatively small size (he stands just 5-foot-10, 190 pounds), the Guelph winger had what it took to become a dynamic difference-maker at the NHL level. It wasn’t long before he justified the front office’s faith in him. Fabbri’s final season with the Storm was not quite as successful as his draft campaign, but that was partially because it was cut short. This interruption was not injury, but rather the World Junior Championship, where his six points in five games helped Team Canada take home a gold medal. The Blues had seen enough to call Fabbri up to the AHL after his junior season ended. The following season, he’d be in the NHL. There, he had a strong rookie season, quickly becoming a fan favorite with 37 points in 72 games. Much like he had done in the OHL two years before, he took off in the playoffs, scoring 15 points in 20 games, tying Vladimir Tarasenko for the team-lead. He looked primed and ready to shine in his sophomore season, but unfortunately, that’s when disaster struck. Fabbri’s 2016-17 season was off to a terrific start: with 29 points in 51 games, he was well on his way to surpassing his rookie total. Then, in a seemingly innocent play, everything changed. With 11:25 left in the first period of a game against the Pittsburgh Penguins, Fabbri took a hit from Carter Rowney while skating along the boards. The hit was clean, but with his knee elevated, he collided with the boards awkwardly and immediately crumpled to the ice in pain. Play was stopped when the officials noted his condition, and he was helped off the ice by trainers and teammates. It was announced the next day that Fabbri had damaged his ACL and would require season-ending surgery. It was a devastating blow to the Blues and to a young player looking to build his reputation. But he was expected back for the following season, and indeed did return in time for training camp. Unfortunately, though it wasn’t known at the time, the repair in his knee was not completely successful. When tested in game action in the preseason, it failed, meaning he would miss another season. Fabbri and general manager Doug Armstrong discussed the news in a press conference. I think that there’s the hope of a full recovery, but the reality is the more surgeries you have… things can go wrong… What I’ve been told by our training staff and our doctors is that they expect a full recovery… Now he’s just missed a full year and a half of hockey and we have to [get him] back into the NHL. 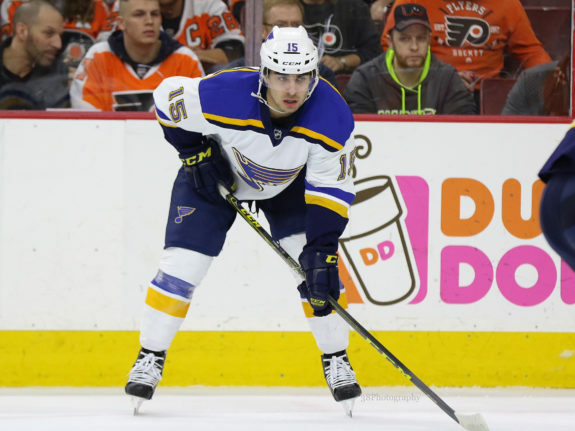 After another year of taxing rehabilitation, Fabbri entered the 2018-19 season with a successfully repaired knee and a desire to put these injuries behind him. Fans expected big things from the youngster, but his season has been anything but what the fans expected. It would take until Nov. 1 for Fabbri to return to the lineup, but once he did, many expected him to thrive. Unfortunately, it was slow going. Though he grabbed an assist and was plus-two in his return, that was one of just four points he would collect in the month of November. On Dec. 1, he would suffer something with which he’d become all too familiar: an injury. Thankfully, this injury was to his shoulder, but it did cause him to miss all but the first and last games of the month. 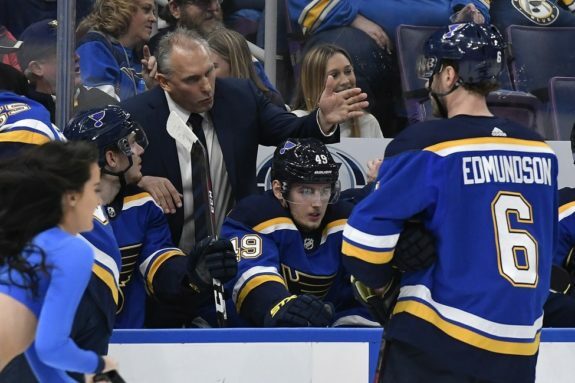 Since then, he has struggled to find playing time under Blues interim head coach, Craig Berube. Since his Dec. 31 return, Fabbri has played in just 15 of 38 possible games, with Berube choosing to deploy him in a fourth-line role when he is in the lineup. That role is not one that fits his skillset, so he has struggled to produce and earn a more permanent spot. It’s a vicious cycle that has kept him largely an afterthought for most of the season. Thus, fans have questioned what Fabbri’s future is with the Blues, or whether he has a future there at all. Fabbri is in a tough predicament: he is not receiving enough playing time to prove that he deserves to keep playing. Projecting into the Blues’ future, this is not a problem that will easily resolve itself. They have a loaded group of forwards, with more youngsters like Klim Kostin and Jordan Kyrou on the way. The team needs to decide whether it wants to create a future where Fabbri has a certain guarantee of playing time. NHL opportunities are not a given, but the obstacles of injury, rust, and wrongful deployment are too great for almost anyone to overcome, and he deserves a fair opportunity to show what he still has. If the Blues decide they cannot offer that to Fabbri, then the best thing for both parties may be a trade. If Fabbri can join a team where he is still a top-nine player on his worst night, we will finally be able to know whether he can ever resume the once bright future he had before the knee injuries. It would be disappointing for the Blues organization to give up on that potential, and it would be hard for Blues fans to see a favorite go elsewhere. But sometimes, even in the business that is hockey, you need to do the right thing. If the Blues cannot guarantee Fabbri a spot, then the right thing is to trade him or let him sign elsewhere as an RFA in the offseason, and give him a chance at a fresh start.